When psycho-spatial composer Nelson Gastaldi passed away in 2009 at the age of 77, he left behind a unique musical legacy that is only now beginning to be unveiled. 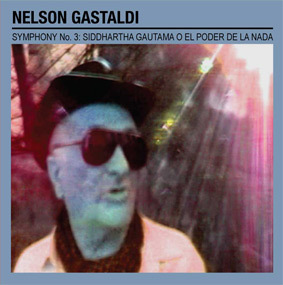 A self-described “musical nihilist with noble and mystic origins” (as well as an accomplished visual artist), Gastaldi supported himself and his family with a job at an electric company in Buenos Aires, Argentina, while creating an astonishing body of work that went virtually unheard during his lifetime. Synthesizing his wide-ranging interests (medicine, linguistics, Chinese and German philosophy) into his music, he welcomed paranormal / initiatic experiences into the compositional process, creating homemade Sibelius-meets-Sun Ra symphonies. The only previous publication of his work was in Bananafish magazine, which featured an excerpt of Symphony No. 3 on an accompanying CD. The same issue also contained his sole English-language interview, in which he waxed: “The human being runs at the side of a river. When he is young, he runs faster than the river; in mid-life he runs at the same speed as the river; and at last he falls down and the river keeps going.” Take a dip into the strange and beautiful river of Nelson Gastaldi. Download coupon included. Bananafish has kindly allowed the interview with Gastaldi to be accessed here. When Reynols member Roberto Conlazo met Gastaldi in Buenos Aires in 2003, he was astonished to behold him compile symphonic works using small cassette recorders and Casio keyboards, lots of toys, Chinese mechanical birds and a trumpet. Gastaldi clearly had colossal musical ambition, unconfined by his extremely limited resources: this is a symphony in three movements conceived along 19th century lines but with 20th century concerns such as micro- and polytonality stirred in. It takes a moment to adjust to his sound — lo-fi Bruckner with synth marimbas — after which it’s easy to be swept along.